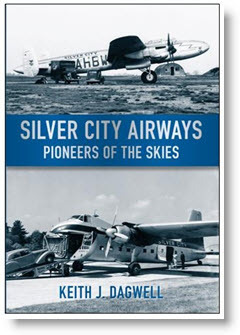 "Silver City Airways - Pioneers of the Skies"
Silver City Airways rose from obscure beginnings to pioneer and become world famous for it's cross-Channel car ferry service, when the only alternative was a slow sea crossing. 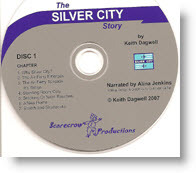 Everyone who was anyone, from the Prime Minister to royalty, flew Silver City. Based in Kent on the Dungeness Peninsular, and eventually expanding to Southampton, in its hey-day the airline ran 240 cross-Channel flights in a day and their airport at Lydd was busier than Heathrow ! Packed with previously unpublished pictures from the Silver City Association archive. The first dedicated history of this unique airline. Includes stories from passengers and worker involved with the airline, from the Berlin Airlift to cross-Channel car ferrying. Silver City Airways achieved far more than the car ferry service, however, and the extraordinary airline has a fascinating history. From playing a part in the Berlin Airlift to freighting racehorses, and from running scheduled passenger flights around the country to breaking speed records across the Atlantic and flying Dakotas in the Libyan desert, this book follows its story. A double CD narrated by Alina Jenkins. This talking book tells the story of the pioneers, the highs and lows of developing a fledgling airline and the bold decisions that helped pave the way for cheaper air travel which today we take for granted. 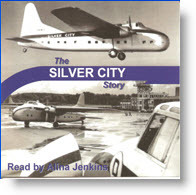 This is the story of Silver City Airways - a tribute to it's founders and staff, a nostagic reminiscence for its customers and inspriation for those who can now only wish they had been there. Price £ 6.00 each (including p&p).